The perfect under-bedspread quilt for a guest bedroom. Thick enough to keep a guest warm but will fit easily in a standard washer. It's great because you can wash it every time a guest stays over without having to take a bully bedspread to a special laundry facility - similar to what (hygenic) hotels do these days. Nice pattern and two fluffy pillowcases. WELL worth the purchase price. 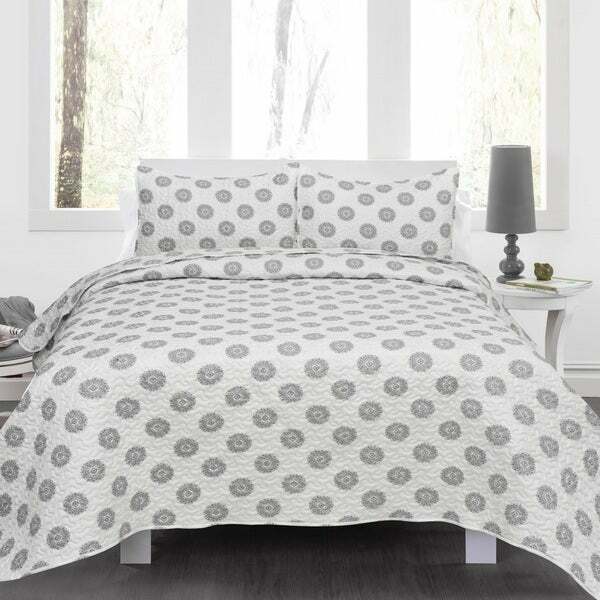 Sleep in style with this Marina Microfiber quilt set. Featuring a floral pattern and reversible stripe pattern, this set adds a chic flair to any decor. The machine washable, 100-percent polyester ensures a comfortable night's sleep. I love this quilt set. I live in a very hot area and this quilt is nice and lightweight. Nicw quilt- made well- pattern it is NOT gray- as iy looks it is black. So thin I wouldn't call it a quilt! Same print on both sides but summary list it as different on the reverse side. Sending this one back. Being this quilt was micro-fiber I was thinking it would be soft. It's not, it's actually a little scratchy. It has a terrible chemical smell and mine came with a yellowish stain on it. I bought this quilt to layer on our bed so it won't show all that much. The seems are not very neatly sown. Also, it seems very stiff. It was inexpensive, so I guess you get what you pay for. Didn't really look the same in person unfortunately!